If your phone has an unlocked bootloader, you can use Fastboot commands to flash factory images. That may sound like a bunch of technical jargon, but when it comes down to it, this is the best method for updating a rooted device, fixing a bricked phone, reverting to stock, or even getting new Android updates before everyone else. Much like ADB, Fastboot is a very powerful Android utility that accepts commands through a terminal shell. But if that sounds intimidating, don't worry—because once you've learned your way around things, you'll know so much more about the inner workings of Android, as well as how to fix most common problems. 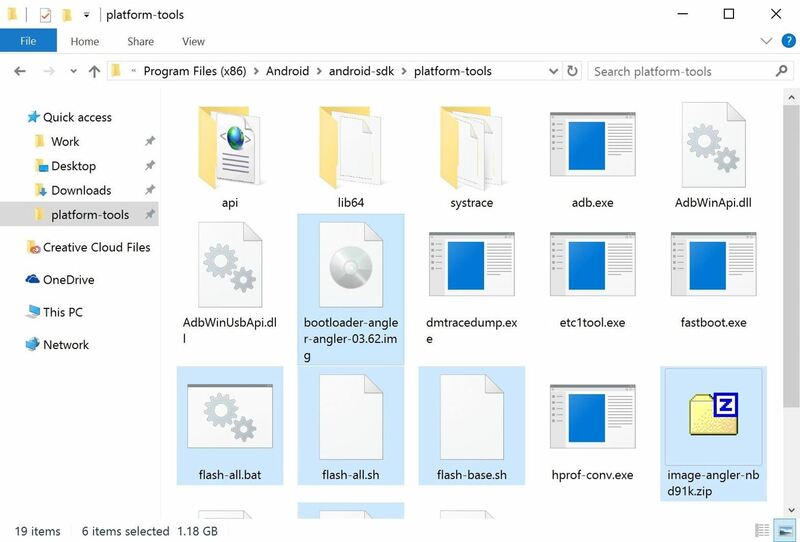 Don't Miss: Know Your Android Tools: What is Fastboot & How do You Use It? The process outlined below will work for most Nexus, Pixel, HTC, and Motorola devices, as well as phones and tablets from many other manufacturers. However, Samsung devices use their own firmware-flashing software, so Fastboot isn't the way to go if you own a Galaxy. Instead, it's best to use Odin to flash firmware on a Samsung device, and we've covered that process at the following link. 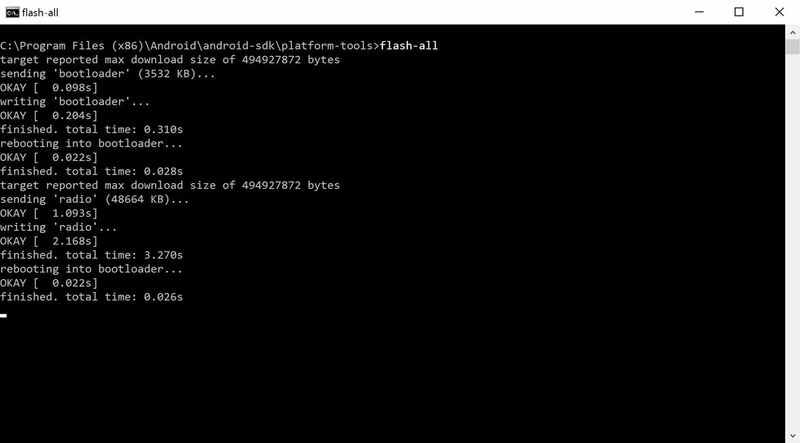 First, you'll have to install ADB and Fastboot on your computer, which are the utilities that let you flash images using Fastboot commands. There are several "one-click" and "light" versions of ADB and Fastboot made by third-parties, but I wouldn't recommend using these because they're not updated as frequently as the official utilities, so they might not be fully compatible with newer devices. Instead, your best bet is to install either the Android SDK Tools, which contains ADB and Fastboot, or just ADB and Fastboot, from Google. No matter if you choose the full package or just the platform tools themselves, they're the real deal. I've outlined the install process for Windows, Mac, and Linux in Method 1 at the following guide, so head over there to get started. In order to flash images using Fastboot, your device's bootloader will need to be unlocked. If you've already done this, you can skip ahead to Step 3. But before you can unlock your bootloader, there's a setting that you'll need to enable if your device shipped with Android Marshmallow or higher preinstalled. To access this setting, start by enabling the Developer options menu on your phone or tablet. 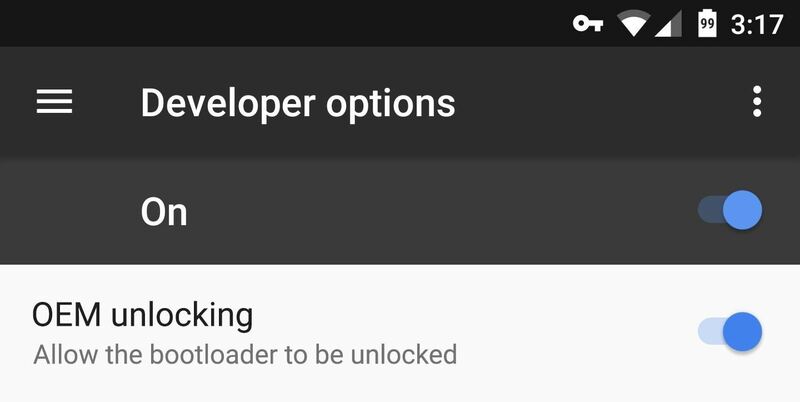 Once you've done that, open the Developer options menu, then enable the switch next to "OEM unlocking," and you'll be good to go. If this option is not present on your device, it's likely that your device didn't ship with Android Marshmallow or higher preinstalled. However, if the option is present but grayed out, this usually means that your bootloader cannot be unlocked, which means you won't be able to flash images using Fastboot. In order to run any Fastboot commands, your phone or tablet will need to be in bootloader mode. This process will vary depending on your device. For most phones, start by powering your device completely off. When the screen goes black, press and hold the volume down and power buttons simultaneously, and keep holding them for about 10 seconds. If that doesn't work, turn the phone off, then press and hold the volume down button. From there plug a USB data cable into your PC, then simply wait a few seconds. If that still didn't work, try repeating the USB cable method, but this time use the volume up button. When you see this screen, make sure your phone or tablet is plugged into your computer with a USB data cable. Aside from that, leave the device alone, as the rest of the work will be done on the computer side of things. Navigate to the ADB and Fastboot installation directory on your computer. For Windows users, this can usually be found at C:\Program Files (x86)\Android\android-sdk\platform-tools. For Mac and Linux users, it depends on where you extracted your ADB folder when you installed the utility, so search your hard drive for the platform-tools folder if you've forgotten. 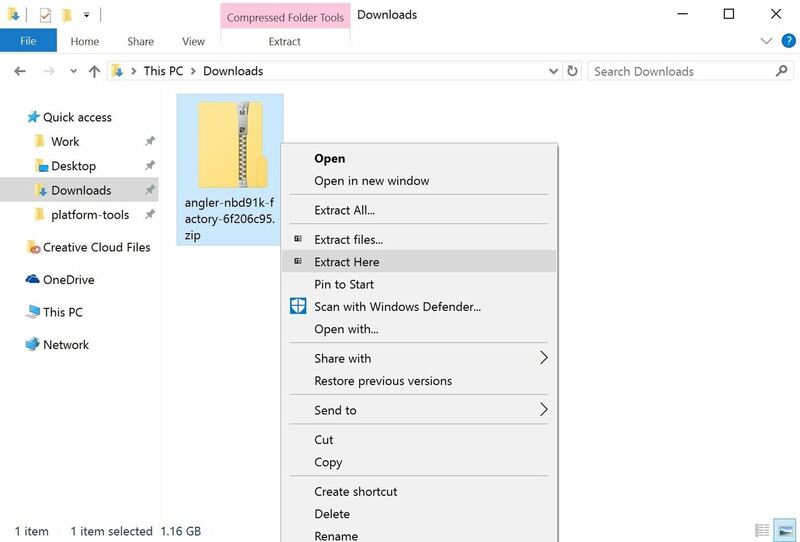 From here, if you're using a Windows PC, hold down the shift button on your keyboard, then right-click any empty space and choose "Open command window here." For Mac and Linux users, simply open a Terminal window, then change directories to the platform-tools folder inside of your ADB installation directory. This next step is something you only need to do once, so if your bootloader is already unlocked, you can skip ahead. Otherwise, you'll need to run a single Fastboot command—but note that this will wipe all data on your device. Before we get into this part, note that I'll be listing the commands for Windows users. Mac users will have to add a period and a slash (./) before each of these commands, and Linux users will have to add a slash (/) to the front. So from the ADB shell, type the following command, then hit enter. If that returns a series of letters and numbers followed by the word "fastboot," then your device is connected properly and you're good to go. Otherwise, refer back to Step 1 to check your ADB and Fastboot installation, and ensure that your device is in bootloader mode as shown in Step 3. 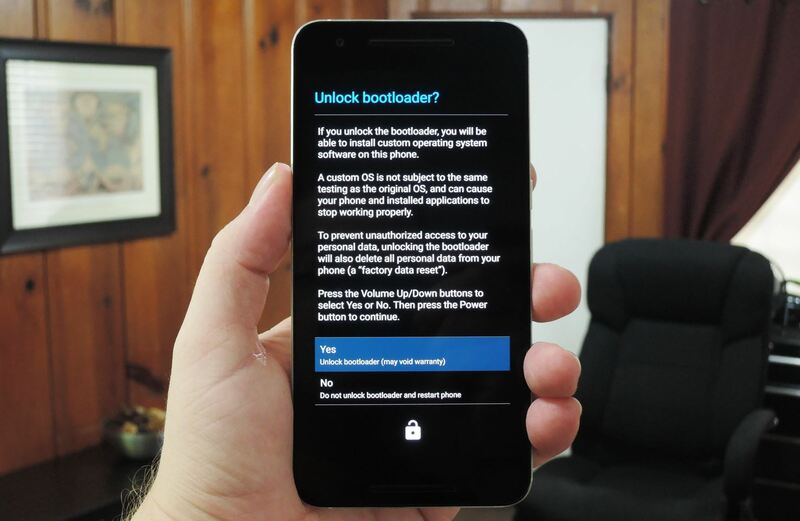 Next up, it's time to unlock your bootloader. Depending on the Android version your device shipped with, this will be done in one of two ways. Sending the bootloader unlock command to a device that shipped with Marshmallow or higher. 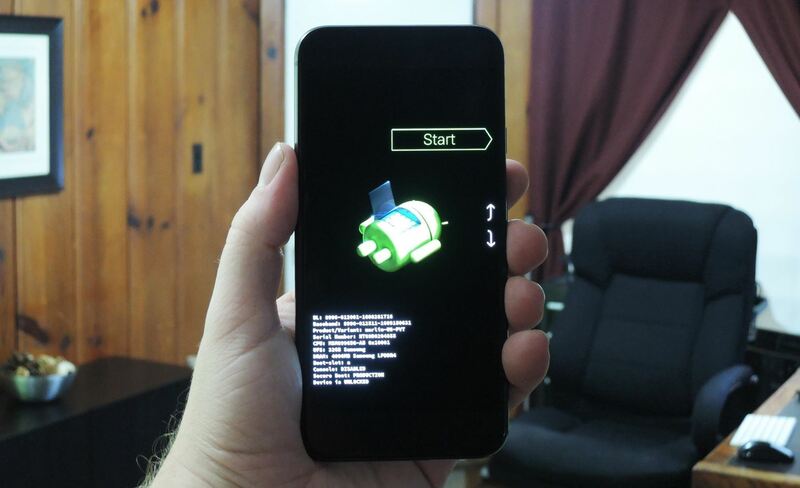 At this point, you'll see a message on your Android device asking if you're sure you'd like to unlock the bootloader. Make sure the "Yes" option is highlighted, and if it's not, use your volume keys to do so. From there, press the power button, then your bootloader will unlock and your phone will reboot back into Fastboot mode. Now that your bootloader is unlocked, you're ready to start flashing factory images—but first, you'll have to download the actual images themselves. Below are some links to download the factory images package for common devices. With each of the above links, simply locate your device model in the list, then download the latest available firmware on your computer. If your manufacturer is not listed here, try Googling "factory images for <phone name>." Now it's time to flash the images. The first thing you'll want to do here is extract the factory images archive that you downloaded from your manufacturer's website. For that part, I'd recommend using 7-Zip, as it's free and works with most archive formats. Extracting the factory images archive. 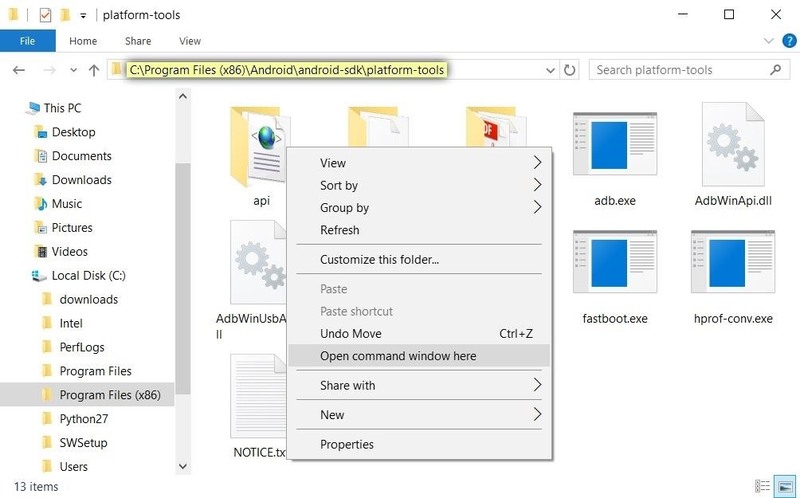 Next, move all of the contents of the archive to the platform-tools folder inside of your ADB installation directory, then open an ADB Shell window in this folder. For more information on that, refer back to Step 4 above. Factory image files transferred to the platform-tools folder. Aside from that, there are two different approaches you can take when flashing the images. I'll outline both of them in separate sections below. Most factory images packages will contain a "flash-all" script that applies all of the images in one fell swoop. If you're trying to recover your device from a soft brick, this is the simplest way to go. However, it will unroot your device and wipe all existing data, so if you'd rather avoid that, see Option 2 below. The process will take a few minutes, but when it's done, your phone should automatically reboot and you'll be running complete, 100% stock firmware. For a second option, you can flash the system images individually. This method takes some extra work, but it can be used to un-root, update, or un-brick your device without losing existing data. Start by extracting any additional archives from the factory images package. Sometimes, factory images packages can contain a series of three or four nested archives, so make sure to unzip all of them. From there, copy all of the image files to the main platform-tools folder—in other words, don't leave them in any sub-folders. All images extracted from factory images package into platform-tools folder. From here, there are two images that you can get rid of: cache.img and userdata.img. These are the images that will overwrite your data and cache with blank space, so if you don't flash them, your existing data will remain intact. Of the remaining images, six make up the core elements of Android: boot, bootloader, radio, recovery, system, and vendor. Next up is the big one: The system image. This one contains all of the files that make up the actual Android OS. As such, it's the most essential part of any update. However you may not be updating your phone. You may just be re-flashing the stock firmware to recover from a soft brick. If this is the case, the system image is often the only image you need to flash in order to fix everything, because it contains the entirety of Android. In other words, if you flash this image and nothing else, it will undo any changes you made with root access and put everything back the way it was. Flashing the factory images individually. At this point, your device should be fully updated, or if you were trying to recover from a soft brick, it should be running flawlessly. And since you now know what each of the core system images actually does, you'll have a better sense of how Android works going forward. Flashing factory images individually has helped me understand more about Android than any other mod or process. 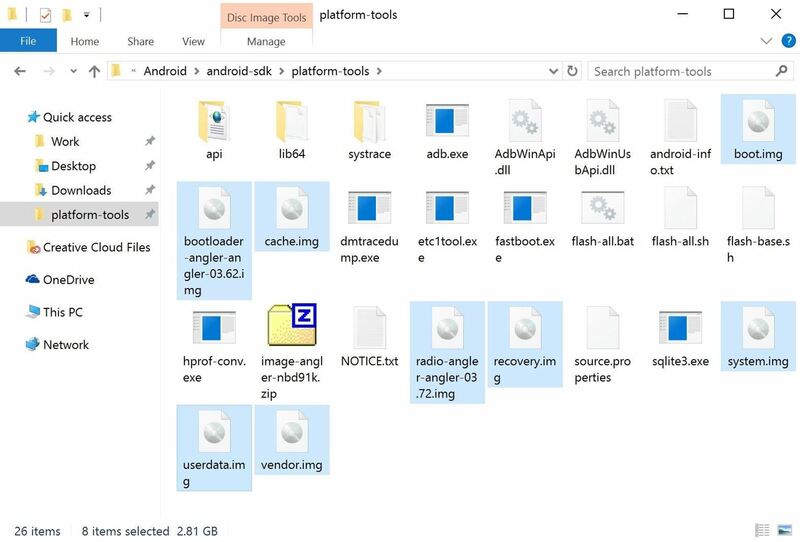 If you think about it, Android is just a series of images written to flash storage, and now that you've dealt with each of them individually, you should be able to identify and resolve root-related issues a lot easier. You can use the method to flash small partition (boot, recovery etc. ), but normally cannot to flash system partition. Have you used the newer version from the official SDK Tools? It has a feature that splits the system image into smaller pieces that fastboot can handle. It'll say "sending sparse system (1/3)," pretty cool stuff. But it might require a newer phone or bootloader version, I'm not sure about that. Hi, I really need some help :( I already flashed everything as shown in the manual step-by-step guide, but my phone is still on a bootloop. I have a Moto E4 Plus (XT1772) and it got bricked when I installed TWRP, now it gets stuck at the boot image. I already flashed boot.img, system.img and recovery.img, but I have no bootloader.img in the stock ROM I got. What can I do? Thsks it was really helpfull. 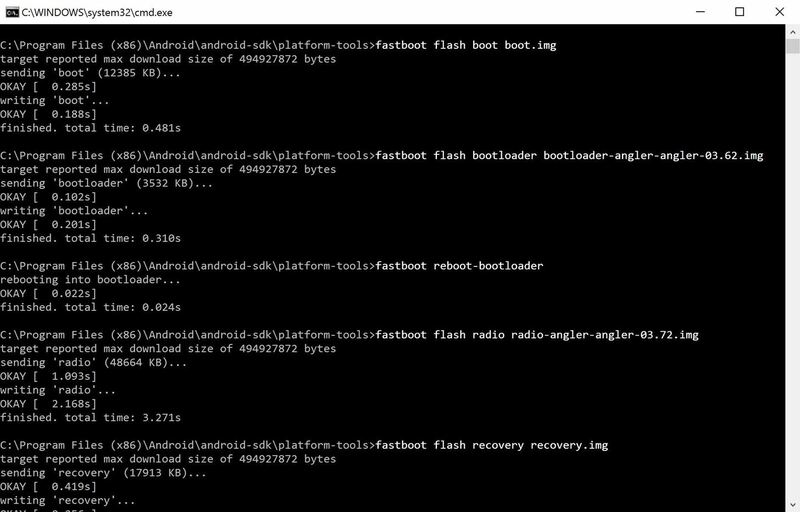 I bricked my mate 10, but fortunatelly if you persist many times (perhaps more than 3) to get into the fastboot mode then you have the acces to follow this tutorial and I did. Instructions change a bit but I was guide by the order stablished here. 1. the kernel (fastboot flas kenel "kernel name.img"), 2. recovery ramdisk (fastboot flas recovery_ramdisk "recovery name.img", 3. boot ramdisk, 4. Vendor image and finally 5. system image. The phone its mostly working , the camera, the android codes, youtube and netflix are not running.... So i think it would be required to flah all the files extracted from the update.zip(all the .img )... however the one millon question is: what would be the rigth order to do it? I tried to install a factory image on Nexus 6p. But when I wanted to install system image it gaves size error.it wrote a special size.even it happend when wanted to install it's original factory image. I used 15 secondadb and fastboot installation. I don't know what shouldcan u help me? If u can please send it to my email.i check it every day.